Over the last two decades I’ve lost count of the number of times we’ve visited La Gomera. A friend lives in a remote valley in the heart of Garajonay National Park; so remote it’s a thirty to forty minute drive to her nearest shop. Subsequently, over years of visiting her and also exploring the island’s paths on foot, we’ve seen parts of the island that even the most intrepid hikers don’t get to. There have been many mornings we’ve sat, hypnotized amidst tropical plants, citrus trees, crystal butterflies and Chinese wind chimes, on our friend’s eclectic terrace 1000m above sea level, gazing in quiet amazement (a feeling which has never diminished over the years) across lush, sleepy Los Aceviños as misty fingers perform their captivating dance around the valley’s verdant crevasses. It feels like a world completely cut off from civilisation which, in a way, applies to La Gomera as a whole. Our Canary Island mantra is that each island has a distinct personality. Forget the lazy ‘over developed for mass tourism’ tag applied to the most popular bigger islands in some travel articles; those betray a superficial knowledge of the islands. Each one is fascinating in its own right and even in the best known islands, tourist resorts occupy only a small geographical area. These are seven unique islands (I’m talking about the main ones) with distinctly different qualities. 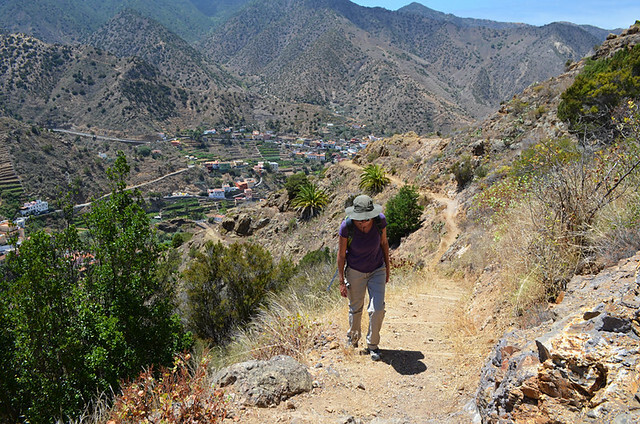 Those differences also apply to walking in the Canary Islands. 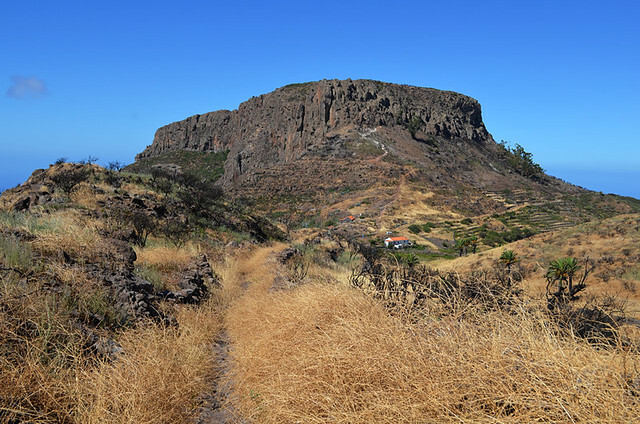 ’10 reasons we enjoy walking on La Gomera’ is the first in a series where we pick out the best of what we particularly like about walking on each of the Canary Islands. And, to show we don’t just see the world through lovely rose-tinted sunglasses, one aspect we’re not so keen on. La Gomera is the second smallest island in the archipelago. A memory which sticks in my mind is many years ago we travelled around La Gomera using public transport. After three days we’d get on a bus and say a couple of ‘holas’ to locals we already recognised from various towns we’d visited during our short time on the island. 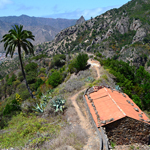 A week’s walking on La Gomera gives a real insight into the island and its people. 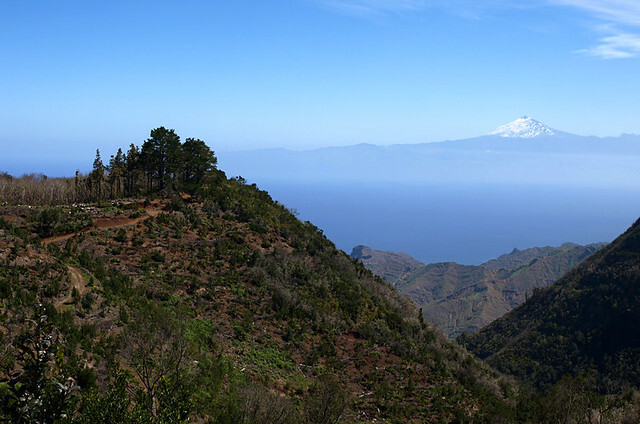 In the past we’ve more or less circumnavigated La Gomera on foot in that time. ‘Cosy’ may not be the appropriate word for winter stays in rural accommodation in the Gomeran hills as central heating is a rarity and Canarios will simply put on another layer before lighting a fire. But intimate, yes. Even in the small-scale coastal resorts of the south of the island there’s a family feel to tourist accommodation. 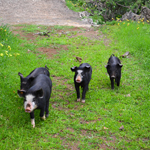 When not visiting our friend we mostly stay in small rural hotels in inland towns like Hermigua and Vallehermoso. 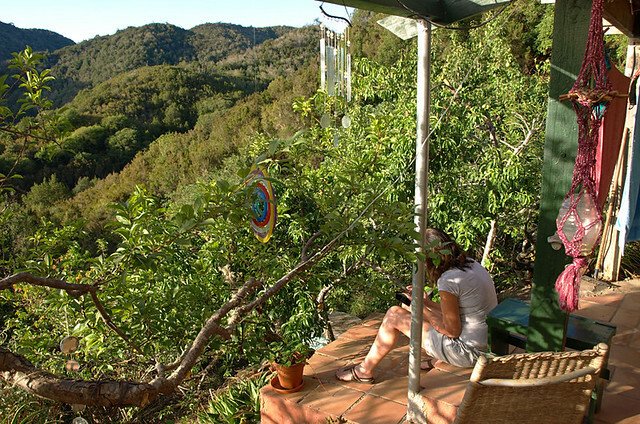 These places give you a feeling of being more immersed in local life. 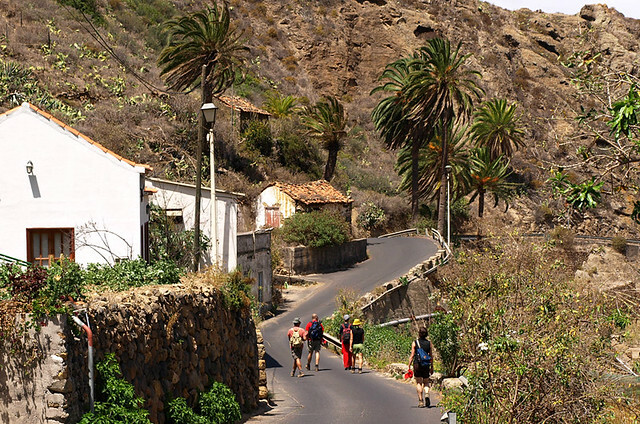 It doesn’t really matter where you base yourself, you can access walking routes from just about any town or village on La Gomera without a long trek through an urban jungle, even in the capital San Sebastian. 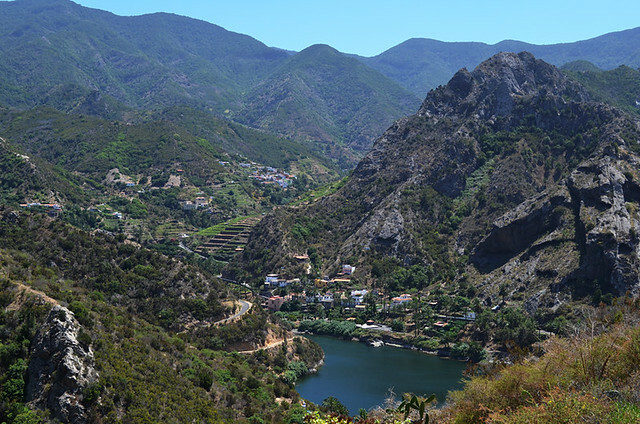 Our favourite base is Vallehermoso where there is a selection of excellent walking routes starting in or passing through the town. 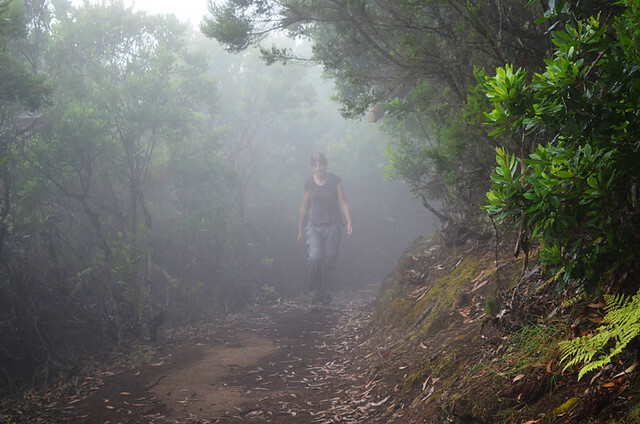 La Gomera is the Canary Island best known for walking. The local authorities there know it. Subsequently, and apart from the occasional glitch, it’s an island well geared to a walking market, especially a German one. Anyone who’s walked in Germany will know that you can get an overdose of signposts on walking routes. La Gomera isn’t quite at that level but, probably not coincidentally, it’s got the best signage of any of the Canary Islands. You find an impressive range of diverse terrain on most of the Canary Islands, but what that actually consists of varies enormously from island to island. On La Gomera at times you can be marvelling at Mediterranean-looking slopes with narrow, stepped terraces reminiscent of the Atlas Mountains. At others, the forest canopy is so dense it doesn’t take much imagination to think you could easily stumble across a troop of silverback gorillas. And in other parts, scenes of tall, skinny palm trees towering above lone cottages with woodsmoke billowing from their chimneys are pure South America. 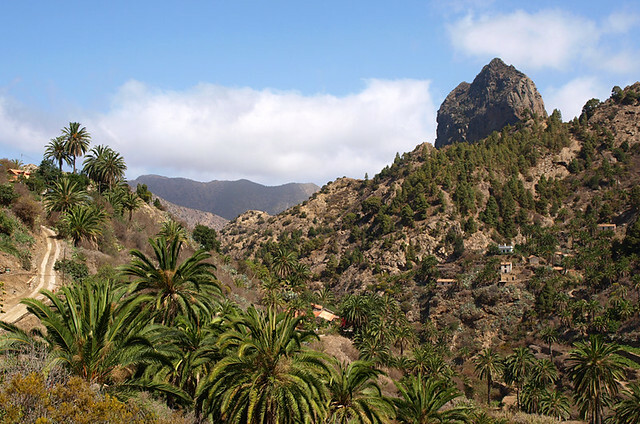 In altitude terms, La Gomera doesn’t get close to reaching the giddy heights of its neighbour Tenerife. 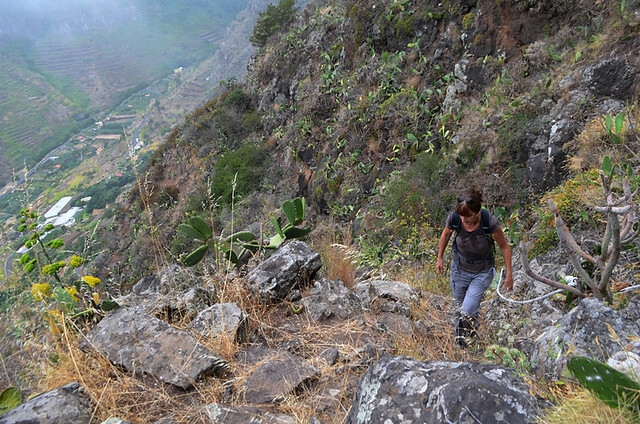 But when tackling some of Gomera’s undulating barrancos on foot it definitely feels like it does. The nature of the island’s topography is such that it’s a circular island with deep ravines cut into it which makes driving a winding in and out affair and walking often an up and down one. The best routes involve climbing steeply, then descending steeply, then repeat… a few times over. This is a rugged, exhilarating landscape which can be underestimated by some. Taming those paths is immensely satisfying. What there is to eat and drink in any walking destination is important to us. Most Gomeran towns have a handful of very good tascas in which to eat or enjoy a post-walk cerveza. 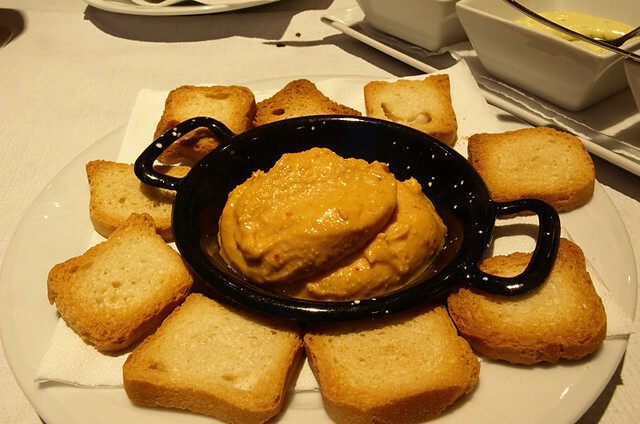 The food is generally simple, hearty traditional Canarian fare, but there are a few interesting alternatives – e.g. Casa Efigenia at Las Hayas, where Efigenia has been dishing up the same set vegetarian menu for years. Then there’s the snazzy new kid on the block, Mirador de Abrante with its glass walkway, Silbo whistling waiters and sophisticated tapas. 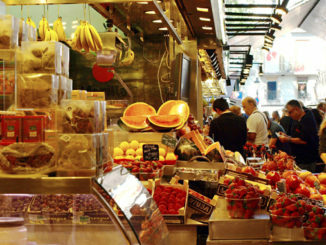 Distinctly local goodies to look out for are almogrote (a strong cheese pate) and miel de palma (palm honey). 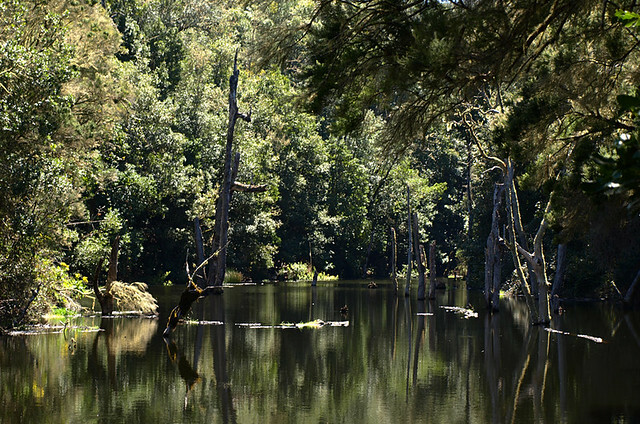 Garajonay National Park is a UNESCO World Heritage Site – a misty rainforest carpeting around 11% of the island and consisting mostly of laurisilva. Once such forests covered much of Europe and North Africa, but now they only can be found in the Macaronesian Islands. That’s the official UNESCO blurb, but what does it really mean? It means you get to step back in time to another era and walk through a forest which can be a) enchanting, b) atmospheric c) damp d) misty e) cool f) quite spooky. Great walking needs to have sensational views. 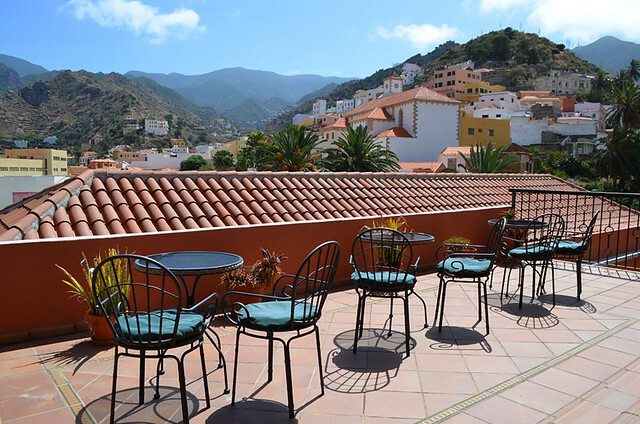 La Gomera ticks that box, again and again. Picturesque valleys – tick. Dramatic ravines – tick. Towering peaks – tick. Sparkling ocean views – tick… and so on. Icing on the cake is Mount Teide on neighbouring Tenerife which muscles its way into many vistas. Our favourite places for walking have ingredients that extend beyond plenty of routes with good views. We want extras, those aspects which make locations uniquely different. Some can be natural, some are courtesy of human hands. Quirks if you may. La Gomera boasts plenty of these including a fountain in a tree, a mini Louisiana-style swamp with ghost trees splitting the water, and a rather complicated magic drinking fountain at Epina. 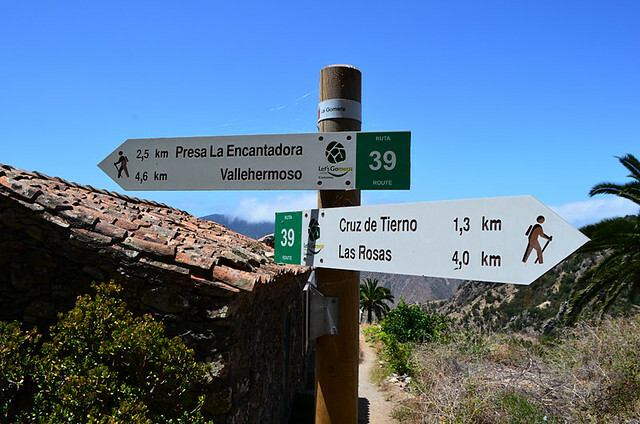 Everybody already knows La Gomera is a top walking destination. As a result, some of the most popular routes can be quite busy during the height of the walking season.